Yellow Thunder was born in 1774. He was described by a contemporary as a "..tall, stately man of much dignity, respected by all, a zealous Catholic and a generous friend. Brave, honest, faithful, though unlettered, he was one of Nature's noblemen." He wed the daughter of a neighboring Menominee leader around 1827, and they made their home near the Wisconsin River in Delton Township. As white settlers moved into southern Wisconsin, they began occupying land that had previously been owned by the Native Americans. More pioneers arrived and land became increasingly scarce, depriving the Ho Chunk of their hunting grounds. In 1829, and again in 1832, the Ho Chunk were compelled to sell large amounts of land in Southern and central Wisconsin. As settlers became more wary of the perceived threat of attack, they petitioned Washington to remove the Ho Chunk. In 1837, after five years of pressuring by government officials, the Ho Chunk were coerced into selling all of their remaining lands in Wisconsin. Delegations of armed soldiers were dispatched and in 1840 the Indians were rounded up and unceremoniously shipped off to a reservation in Iowa. Yellow Thunder and his tribe were among the displaced. 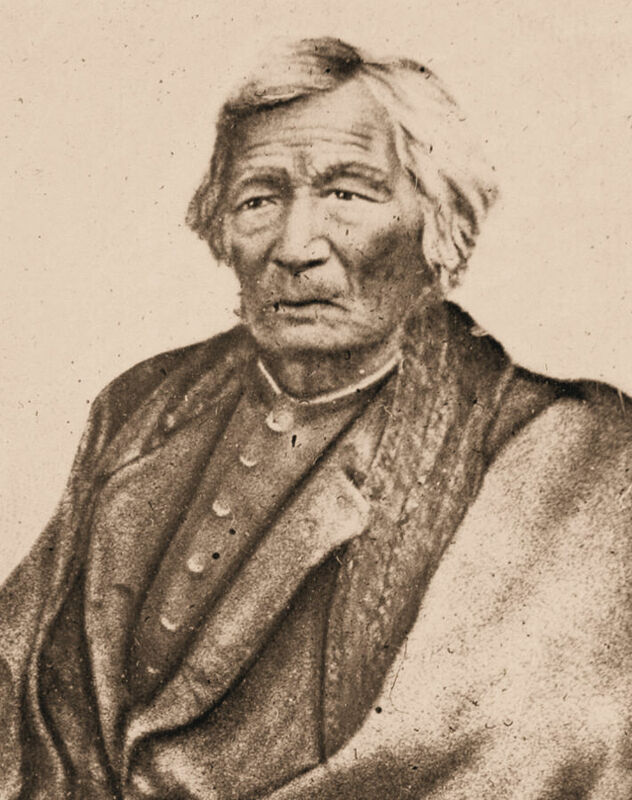 Many, however, became homesick for their native homelands, so the following year, Yellow Thunder, his family and others, returned to Sauk County. After having been removed again in 1848, Yellow Thunder decided that he might be able to prevent another forced exodus by becoming a landowner. Taxpayers could not be forcibly removed from their land. In 1849 he went to the Mineral Point land office and claimed a 40 acre homestead in Delton Township (Section 39, SE corner) where he lived with his wife for a number of years. Yellow Thunder's wife died during the winter of 1868 in their wigwam. She was buried in a grave, 4 feet by 2 feet, and 4 feet deep. 'She was removed from the tent on a sled and laid beside the grave in her blanket," wrote a witness. "She was then placed in the grave in a sitting posture, with her blanket wrapped around her and her face to the west. Then the Indians danced around the grave chanting their death song according to custom." In 1874, Yellow Thunder moved back to his home near the Wisconsin River and resided in a tent. He died shortly thereafter having contracted blood poisoning from a knee injury. His final request was that he be buried in a wooden box, and that his body be taken back to his home and that it remain there for three days. After the third day, his spirit would ascend to the "Happy Hunting Ground". His wishes were carried out and he was interred alongside his wife. Perry Titus points to the exact spot where his great uncle indicated the grave to be. Yellow Thunder and his wife were originally buried on the land they owned in Delton Township. 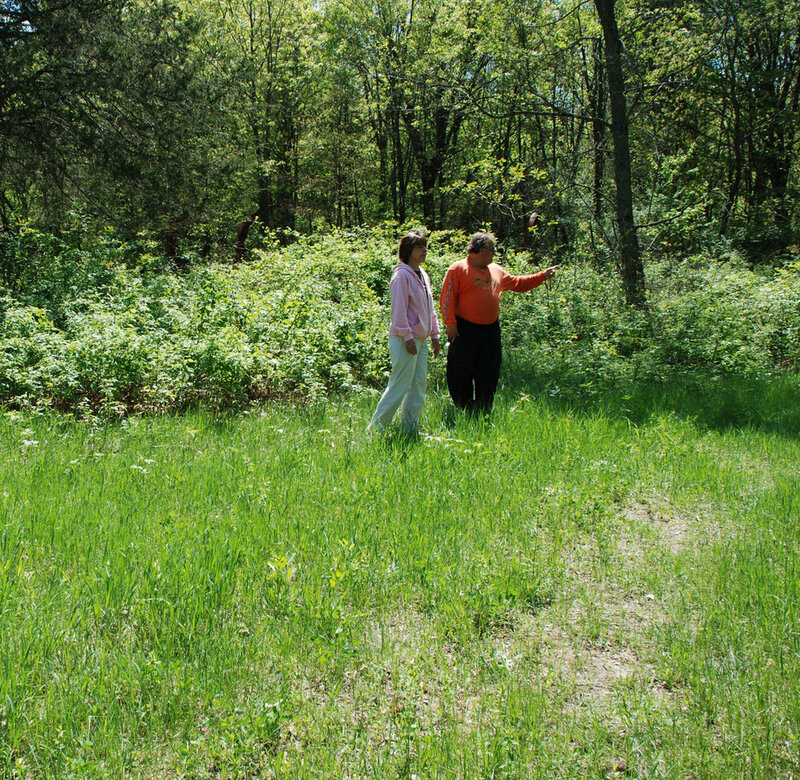 In May, 2009, several members of the Sauk County Historical Society, along with representatives of the Ho-Chunk Nation, sought out that original site. The burial site is located about a half mile off Gillem Road, in a secluded wooded area. Perry Titus, who erected the sign above, recounted that his great uncle had pointed out the exact spot of the original burial. It was located not far from the Wisconsin River. Bev Vaillancourt and Jay Toth, then Archeologist for the Ho-Chunk Nation, discuss the possibility of this being the original location of Yellow Thunder's village. However, Yellow Thunder and his wife were not to rest easy. Various accounts indicate that individuals dug into the burial site in search of artifacts, scattering the bones in the process. The remains were gathered up and placed in a permanent stone marker. In 1909, the SCHS erected this marker for the Chief and his wife as a lasting memorial. Joseph Johnson, chairman of the curator committee of the Sauk County Historical Society, and President, H.E. Cole, led a group of interested members and the marker was erected in Fairfield Township, Section 2, along County Highway A, just south of Shady Lane Rd. H.E. 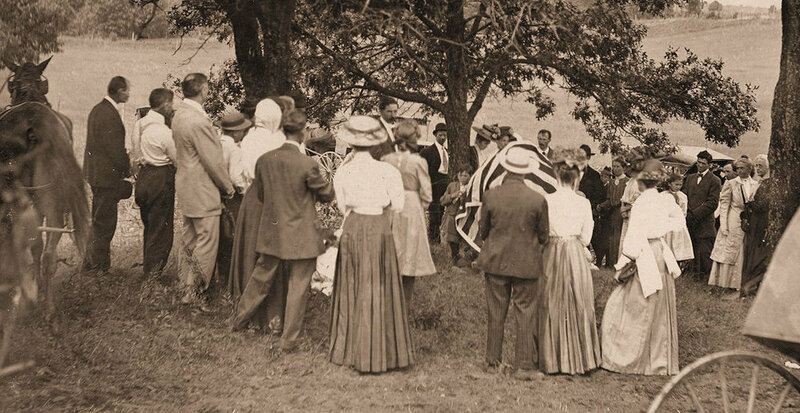 Cole, in his 1918, Standard History of Sauk County, recounts those efforts: "On Thursday, August 19th , a pillar was erected by City Engineer, H.E. French, Edmund Calvert, Charles Goette and H.E. Cole. Field stones were used and they were supplied by Mr. Calvert. A hole two feet deep was dug for the base and the whole laid up with cement. It stands about 4 feet high and 3 feet square. A framework was made and the pillar laid up inside of that. Afterwards the boards were removed." In 1965 the marker was moved just north of Shady Lane Rd., where it exists today, to accommodate the widening of Hwy A. The SCHS is the owner of the Yellow Thunder monument grounds.